Over the last several decades, research and anecdotal experiences have accumulated an impressive evidential case that the development of mindfulness has positive benefits for the individual’s mental, physical, and spiritual life. Mindfulness appears to be beneficial both for healthy people and for people suffering from a myriad of illnesses. It appears to be beneficial across ages, from children to the elderly. And it appears to be beneficial across genders, personalities, race, and ethnicity. The breadth and depth of benefits is unprecedented. There is no other treatment or practice that has been shown to come anyway near the range of mindfulness’ positive benefits. With impacts so great it is important to know how to optimize the development of mindfulness. Most forms of training require or strongly suggest that the participants practice at home. 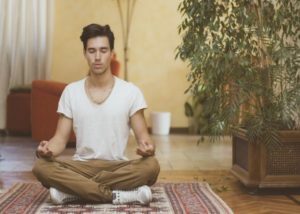 It is not established, however, how important this home practice is to the beneficial outcomes of mindfulness practice. In today’s Research News article “The Utility of Home-Practice in Mindfulness-Based Group Interventions: A Systematic Review.” (See summary below or view the full text of the study at: https://www.ncbi.nlm.nih.gov/pmc/articles/PMC5968057/ ), Lloyd and colleagues reviewed and summarized the published research literature on the benefits of home practice in association with Mindfulness-Based Stress Reduction (MBSR) and Mindfulness-Based Cognitive Therapy (MBCT). They found 14 controlled studies, 8 of which employed MBSR and 6 employed MBCT treating a total of 725 participants. All of these studies used self-report measures of home practice that varied considerably in technique and variables measured. MBSR and MBCT trainings require home practice of 45 minutes per day for 6 days a week (270 minutes). They report that the studies found that actual home practice varied considerably from study to study ranging from 15% to 88% of the recommended amount. The results reported on the impact of home practice on clinical and non-clinical outcome measures were mixed partially due the wide differences in reporting techniques, analyses reported and procedures. Of the 14 reviewed studies only 7 examined the relationship between home-practice and clinical outcomes, of these 4 found that home-practice predicted small but significant improvements on clinical outcome measures. Hence, there are indications suggesting that home practice may be useful for improving the clinical outcomes of mindfulness training. But, the research is so widely different that it is impossible to reach firm conclusions. There is a great need for more attention to the topic employing more standardized assessment techniques. It is important to establish what are the necessary components of practice to produce benefits. The reviewed studies suggest that home practice may be beneficial. This should help in the future in better delineating and refining the most beneficial training techniques. So, improve mindfulness treatment outcomes with home practice. A growing body of research supports the efficacy of mindfulness-based interventions (MBIs). MBIs consider home-practice as essential to increasing the therapeutic effects of the treatment. To date however, the synthesis of the research conducted on the role of home-practice in controlled MBI studies has been a neglected area. This review aimed to conduct a narrative synthesis of published controlled studies, evaluating mindfulness-based group interventions, which have specifically measured home-practice. Empirical research literature published until June 2016 was searched using five databases. The search strategy focused on mindfulness-based stress reduction (MBSR), mindfulness-based cognitive therapy (MBCT), and home-practice. Included studies met the following criteria: controlled trials, participants 18 years and above, evaluations of MBSR or MBCT, utilised standardised quantitative outcome measures and monitored home-practice using a self-reported measure. Fourteen studies met the criteria and were included in the review. Across all studies, there was heterogeneity in the guidance and resources provided to participants and the approaches used for monitoring home-practice. In addition, the guidance on the length of home-practice was variable across studies, which indicates that research studies and teachers are not adhering to the published protocols. Finally, only seven studies examined the relationship between home-practice and clinical outcomes, of which four found that home-practice predicted improvements on clinical outcome measures. Future research should adopt a standardised approach for monitoring home-practice across MBIs. Additionally, studies should assess whether the amount of home-practice recommended to participants is in line with MBSR/MBCT manualised protocols. Finally, research should utilise experimental methodologies to explicitly explore the relationship between home-practice and clinical outcomes.